Layers! I think fall fashion is so much more interesting than any other season because of layering. In the winter it’s too cold so you cover everything with a (hopefully) fabulous jacket (sometimes parkas are a requirement in Canada and it’s hard to find a cute one), and in the summer it’s so hot usually one layer is all you can get away with. This look has a few different layers, but I think the look is simple and polished. It all started with this light trench coat – I’m loving the soft khaki colour of it. The top underneath is a light short sleeved button up with some pretty cute ruffles from H&M, and I paired it with my favorite skinny jeans (Rag & Bone) from Aritzia. I’ll be wearing booties all fall and winter this year because they are comfy, and look great with skinny jeans. 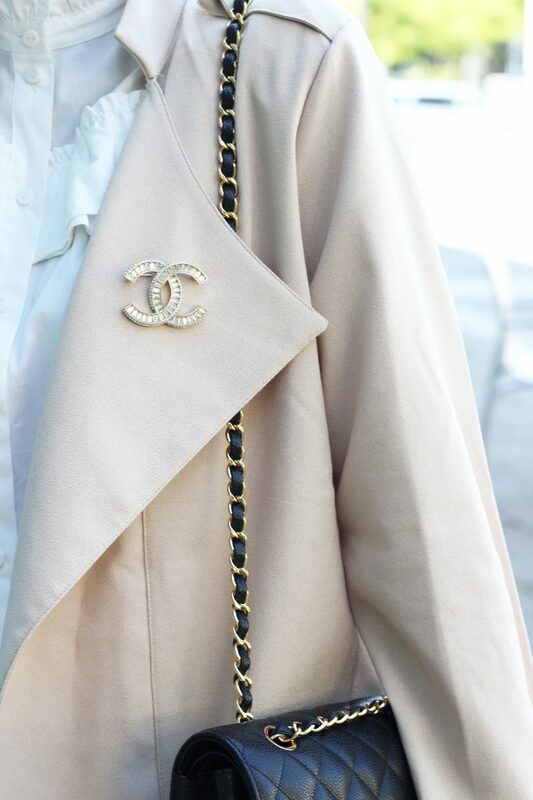 To finish the look I added my Chanel flap bag, and the final touch (or layer) to this look is my Chanel broach that is sparkly enough to make me happy (even on a Wednesday). My light layered fall look included a few trends – ruffles, light khaki, a trench (which will be big for spring 2017), and ankle boots. Chanel doesn’t go out of style so that trend goes without saying! I can’t figure out the weather this week! During the day it’s stifling hot so I’ve been back to wearing my summer dresses, but at night it’s chilly so I’m adding layers. Dressing isn’t easy with this closet renovation we have going on right now – I can’t seem to find anything! I can’t wait until we are finished this project and I can move everything back into my closet! Previous Post Fall Ready with Suzy Shier + Enter to Win a Gift Card! such a great neutral layering piece for fall! i love it. and those shoes are so hot! great outfit!! Thank you! I love the shoes too – I didn’t give them enough love in my post! I love how glamorous you made the trench with the pin and your top! Thank you! I love adding it to an outfit – it’s the perfect accessory! Omg! I need to copy this whole look! You look so glam. The perfect neutral look for fall- love the heels! You look lovely and so glam! Love that this neutral toned outfit has so many details that make it special like the pin, and ruffles on your blouse. I love this trench & those heels, so cute together! Such a cute look and I love that pin on your trench! I love this jacket. Such a perfect layering piece! Love the shade of that trench and the details of that blouse! What a great trench! Love the color! That brooch is such a perfect addition to it too!